Updated at 3:30 p.m. with additional states. Gov. Peter Shumlin said Monday that Vermont will welcome refugees from Syria, and he criticized governors who said they wouldn't accept them due to security concerns related to the terrorist attack in Paris. Shumlin said "seven or eight" Syrian refugees are in the process of relocating to Vermont. "The refugees from Syria are no different than the refugees from anywhere else in the world," Shumlin told reporters. "I would encourage us to do what Vermont has always done ... It’s the spirit of all Vermonters to ensure that when you have folks who are drowning, who are dying in pursuit of freedom, that Vermont does its part." "I would say no as of right now," Massachusetts Gov. Charlie Baker told reporters, according to the Boston Globe. "No, I'm not interested in accepting refugees from Syria. My view on this is, the safety and security of the people of the Commonwealth of Massachusetts is my highest priority. So I would set the bar very high on this." Shumlin said Vermont would potentially welcome more Syrians than are currently scheduled to arrive. "I know Vermont can take more than seven," Shumlin said during a press conference outside the Chittenden Regional Correctional Facility in South Burlington, where he and other officials gathered to tout a recent drop in the state's inmate population. He said that other governors who are rejecting the refugees are "stomping on" the values that "make America great." 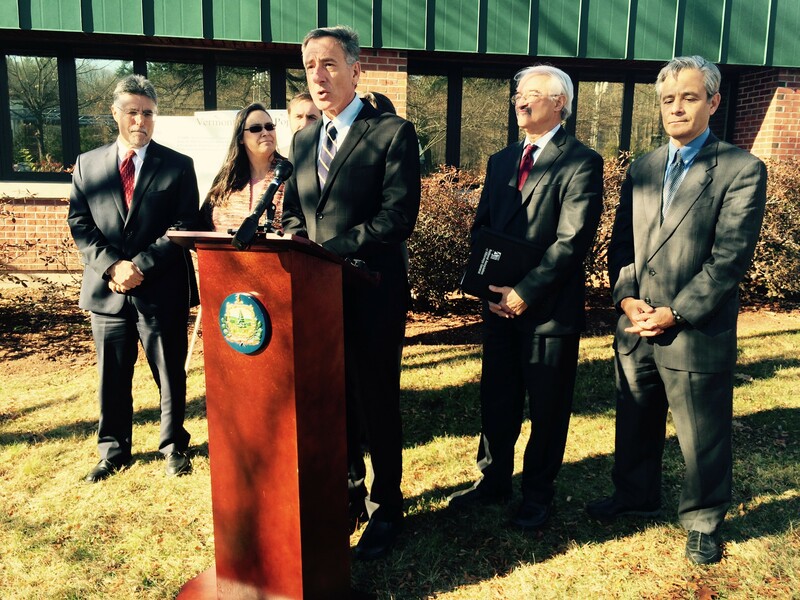 Shumlin said the vetting process includes reviews by the U.S. State Department. "I have confidence in the process. We have a good screening process," Shumlin said. "The Refugee Resettlement Program works closely with the State Department." The Vermont Refugee Resettlement Program typically resettles 300 to 350 refugees a year. On Monday, President Barack Obama, who earlier this year authorized the country to accept 10,000 Syrian refugees fleeing a brutal civil war, criticized officials who support a ban. "Slamming the door in their faces would be against our values," he said. Police are said to be investigating a Syrian passport found near where suicide bombers blew themselves up outside a Paris soccer stadium targeted during a series of coordinated attacks.